This afternoon I searched for a trail (red line on map). While I was unsuccessful in finding this trail, it was a beautiful day. 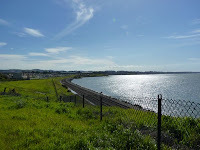 And slogging through uncut, bright green grass for a few blocks looking for a trailhead in East Bay Regional Park land, and strolling down a few quiet residential streets, was certainly no hardship. 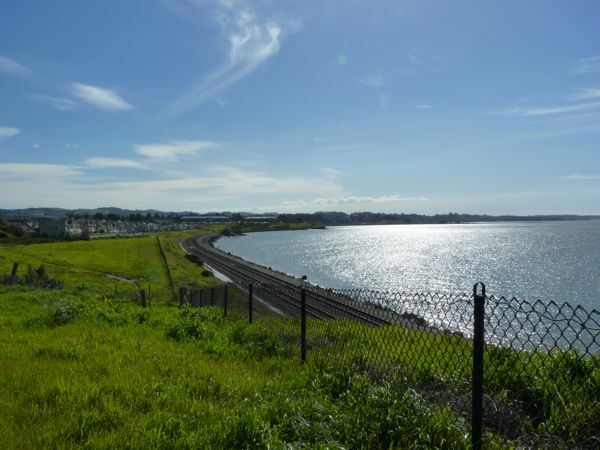 I started today's walk on an offshoot of San Pablo Avenue, near the San Pablo Bay Regional Shoreline - Lone Tree Point area. I crossed over the small Pacific Avenue bridge toward what had been a waterfront restaurant. While it was closed, there were signs that seemed to indicate another restaurant might take it's place in the future. 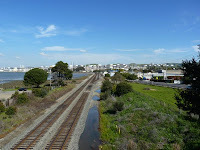 From here, I thought the red line trail might follow the railroad tracks in the area. But, all the approaches I tried were fenced off. 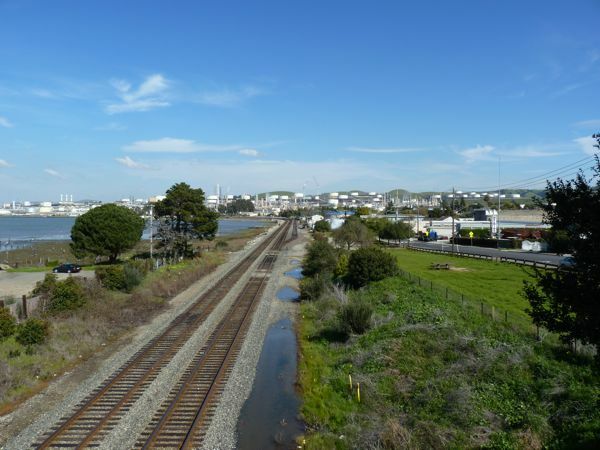 The question: was the trail on the narrow, rocky shore side of the railroad tracks, or the hill side of the tracks? At 2nd Street there was an access point to an area of parkland with a small footpath, but was fenced off when it got closer to the railroad tracks -- where the map seemed to indicate a trail might be. The map seemed to indicate a trail that started around 2nd Street and proceeded Southwest from here. 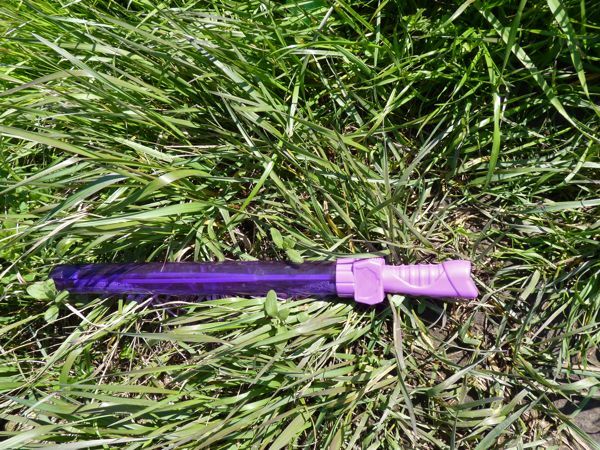 The green grass was tall enough in some places that it might be easy to lose items -- like this (toy) purple light saber. 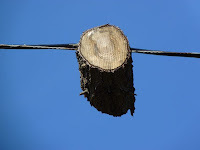 Walking down residential streets, I saw an odd site. Where a large tree had been, there were now just trapped bits of banches fused to utility wires, left to hang in the sky. Flightless, suspended wooden birds. 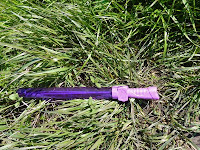 I also saw several cats sitting in driveways and yards, taking in some sunshine. 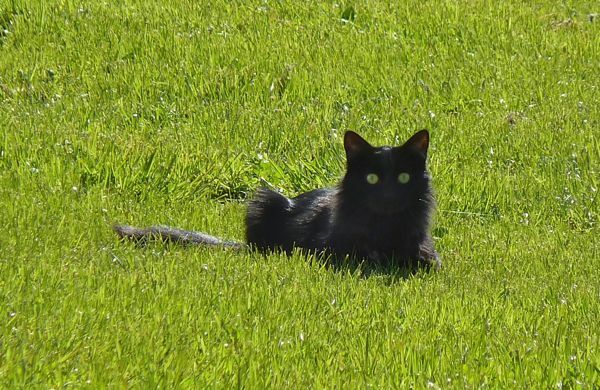 One dark colored cat with bright green eyes against bright green grass stood out.